hService of Diagnostic Imaging (D.I. ), The Ottawa Hospital, Civic Campus, Ottawa, Ontario, Canada;. lDepartment of Neurointerventional Radiology (D.F.K. ), Mayo Clinic, Rochester, Minnesota. 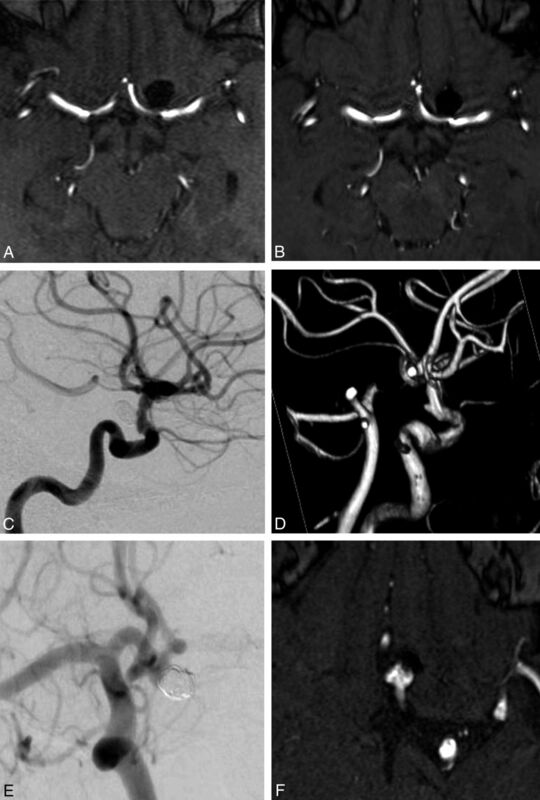 BACKGROUND AND PURPOSE: Patients treated with coiling are often followed by MR angiography. Our objective was to assess the inter- and intraobserver agreement in diagnosing aneurysm remnants and recurrences by using multimodality imaging, including TOF MRA. MATERIALS AND METHODS: A portfolio composed of 120 selected images from 56 patients was sent to 15 neuroradiologists from 10 institutions. For each case, raters were asked to classify angiographic results (3 classes) of 2 studies (32 MRA-MRA and 24 DSA-MRA pairs) and to provide a final judgment regarding the presence of a recurrence (no, minor, major). Six raters were asked to independently review the portfolio twice. A second study, restricted to 4 raters having full access to all images, was designed to validate the results of the electronic survey. RESULTS: The proportion of cases judged to have a major recurrence varied between 16.1% and 71.4% (mean, 35.0% ± 12.7%). There was moderate agreement overall (κ = 0.474 ± 0.009), increasing to nearly substantial (κ = 0.581 ± 0.014) when the judgment was dichotomized (presence or absence of a major recurrence). Agreement on cases followed-up by MRA-MRA was similarly substantial (κ = 0.601 ± 0.018). The intrarater agreement varied between fair (κ = 0.257 ± 0.093) and substantial (κ= 0.699 ± 0.084), improving with a dichotomized judgment concerning MRA-MRA comparisons. Agreement was no better when raters had access to all images. CONCLUSIONS: There is an important variability in the assessment of angiographic outcomes of endovascular treatments. Agreement on the presence of a major recurrence when comparing 2 MRA studies or the MRA with the last catheter angiographic study can be substantial. In clinical practice, the evolution of treated aneurysms is often followed by comparing the follow-up MRA with the final catheter angiogram of the embolization procedure. The reliability of the diagnoses of a stable occlusion or a recurrent lesion when the verdict depends on a comparison between 2 different imaging modalities (the MRA and the catheter angiographic results) has so far not been studied, to our knowledge. Our objective was to assess inter- and intraobserver agreement in diagnosing aneurysm remnants and recurrences by using multimodality imaging, including DSA-MRA and MRA-MRA comparisons in close-to-clinical conditions. The present report was written in compliance with the Guidelines for Reporting Reliability and Agreement studies.8 The evaluation of the intra- and interobserver variability in adjudicating outcomes of endovascular treatment was primarily done by electronic survey by using a portfolio of selected images (DSA-MRA and MRA-MRA) to ease the participation of multiple readers from various backgrounds, institutions, and countries. A second study restricted to expert readers having full access to the set of angiographic and MRA data on the same patients on the hospital PACS system of a single institution was designed to validate the results of the electronic survey and resemble clinical working conditions. On the basis of Donner and Rotondi9 (where for an expected K0 of 0.600 with a prevalence of 0.3 and 5 raters, 24 subjects are sufficient for the lower limit of a 95% 1-sided confidence limit to be no less than 0.400), we estimated that 24 cases per group (MRA-MRA and DSA-MRA comparisons for a total of 48 cases) would suffice to provide meaningful results. The number of cases was increased to 56 to account for potential missing responses and to include a spectrum of patients followed by using various follow-up methods. Images were retrieved from 52 patients with 56 coiled aneurysms (all platinum coils) followed between May 2012 and June 2013 in 1 center. Cases were selected to include at least 2 comparable images from 1.5T or 3T MRI or angiographic series either immediately following treatment or later. Two authors (J.-C.G. and S.J.) selected the cases, aiming to include approximately 50% of easily replicable verdicts (25% of large recurrences, 25% of stable occlusions) and 50% of less clear cases. Cases and proportions were chosen to mimic a typical endovascular case series and to aim for a prevalence of approximately 30%–40% major recurrences, to minimize paradoxes of κ statistics.10,11 The characteristics of patients are summarized in Table 1. Detailed characteristics for each patient can be found in On-line Table 1. A portfolio composed of 120 images from 56 cases (typically 1 pair of images per case) was assembled. On each page of the electronic survey, 1 postembolization and 1 follow-up image (at least) or 2 follow-up MRA images were displayed side by side. Most MR images (n = 92) were time-of-flight source images, but 8 were 3D reconstructions. There were 32 MRA-MRA pairs (22 comparing 1.5T–3T; three, 1.5T–1.5T; five, 3T–3T; and 2 comparing 3T–1.5T) and 24 DSA-MRA pairs (14 comparing DSA with 3T and 10 with 1.5T MRA). All MR imaging examinations were performed in 1 center; MR imaging protocols used for postcoiling surveillance included 3D TOF angiography of the circle of Willis on either a 1.5T Avanto (Siemens, Erlangen, Germany) or a 3T Achieva X system (Phillips Healthcare, Best, the Netherlands). The 1.5T 3D TOF sequence was performed with the following parameters: TR, 25 ms; TE, 7 ms; section thickness, 0.7 mm; FOV, 200 mm. The 3T 3D TOF sequence was performed with the following parameters: TR, 25 ms; TE, 3.5 ms; section thickness, 1.0 mm; FOV, 200 mm. No clinical information was provided. Observers had to independently grade each image according to a 3-value scale (complete occlusion, residual neck, residual aneurysm), graphically displayed on each page.5,12 They were also asked to make a final judgment regarding the presence of a recurrence, according to a 3-value scale (no recurrence, minor recurrence, major recurrence) by comparing the 2 images. The definition of a major recurrence was “a saccular recurrence of a size sufficient to allow retreatment.” Any other increase in the residuum was to be labeled a minor recurrence.5,13 The portfolio was provided electronically (On-line Appendix). The portfolio was sent to 15 participants, selected because they had served as a core lab for endovascular trials (n = 5), participated in ongoing trials (n = 5), or were on lists of potential participants (n = 5). There were 14 interventionists (13 neuroradiologists) working in 10 different centers from 3 different countries (United States, France, and Canada). There were 8 senior (4 with >10 and 4 with >20 years; maximum, 40 years of experience) and 7 junior observers (<10 years of experience; minimum, 3 years). The portfolio was sent twice electronically at least 3 months apart to 6 raters, blinded to their previous responses, who agreed to participate in the intraobserver agreement study. Because agreement on judgments based on pairs of selected images differs from the normal clinical context, the same cases were independently reviewed, in a random order provided by another investigator, by 4 observers (all interventional neuroradiologists) having access to all images. Two senior observers also independently assessed the same cases twice on the PACS system >3 months apart in a different random order. Detailed statistical results can be found in On-line Tables 2–6. There was a wide variability in angiographic results, with 2–23 cases (3.6%–41.1%) being judged as having a residual aneurysm on the first posttreatment evaluation. On the second set of images, between 12 and 39 cases (21.4%–69.6%) were judged as presenting a residual aneurysm. The proportion of portfolio cases judged to have a major recurrence at follow-up MRA varied between 16.1% and 71.4% (mean, 35.0% ± 12.7%) (On-line Table 2). Interrater agreement regarding the 3 different categories of angiographic results for the 2 sets of images is summarized in On-line Tables 3–6. The category showing a lesser degree of agreement was “residual neck.” Agreement regarding the presence of a recurrence (3 categories) varied greatly between raters from slight (κ = 0.156 ± 0.069 [95% CI, 0.021–0.292]) to almost perfect agreement (κ = 0.874 ± 0.049 [95% CI, 0.777–0.971]). There was moderate overall agreement among raters regarding the final verdict (κ = 0.474 ± 0.009); the category showing a lesser degree of agreement was “minor recurrence.” Agreement improved to nearly substantial (κ = 0.581 ± 0.014) when the judgment was dichotomized as the presence or absence of a major recurrence (Table 2). Overall agreement regarding dichotomized verdicts on cases followed-up by MRA-MRA comparisons was similarly substantial (κ = 0.601 ± 0.018). Agreement regarding a final dichotomized judgment among experienced raters (≥10 years; n = 8; κ = 0.501 ± 0.027) was no better than the agreement among less experienced observers (0–9 years of experience; n = 7; κ = 0.660 ± 0.031). The intrarater agreement regarding final angiographic verdicts varied between fair (κ = 0.257 ± 0.093 [95% CI, 0.074–0.440]) and substantial (κ = 0.699 ± 0.084 [95% CI, 0.534–0.864]), improving with a dichotomized judgment, becoming moderate to almost perfect when a dichotomized judgment concerned MRA-MRA comparisons (Table 2). Three of 6 raters reached a “substantial” level of agreement between 2 interpretations. Raters having access to all images on the PACS system found major recurrences in 13.2%–57.4% of cases (mean, 32.4% ± 15.3%). Agreement was no better when raters had full access to all images than among raters having access to only the selected images of the portfolio (Table 3). Interobserver agreement regarding the presence or absence of a major recurrence varied from slight to substantial, with a median κ of 0.455. Examples are illustrated in Fig 1. Illustrative cases from the electronic survey. Case number 10 is a 66-year-old woman with an unruptured aneurysm of the left ICA bifurcation. All 15 readers agreed on score A (complete occlusion) on first follow-up 1.5T MRA (A) and second follow-up 3T MRA (B). All 15 readers agreed on the final result, “no recurrence.” Case number 31 is a 59-year-old woman with an unruptured aneurysm of the left ICA. All 15 readers agreed on score A (complete occlusion) on first follow-up DSA (C), and 13/15 readers agreed on score B (residual neck) on second follow-up 3T MRA (D). Finally, 14/15 readers agreed on the final result “minor recurrence.” Case number 53 is a 61-year-old woman with an unruptured aneurysm of the anterior communicating artery. On the first follow-up DSA (E), 10/15 readers answered “residual neck” (score B), and 5/15 readers, “residual aneurysm” (score C). On the second follow-up 3T MRA (F), 7/15 readers answered “residual neck” (score B), and 8/15 readers, “residual aneurysm” (score C). The final angiographic result was “no recurrence” for 2/15 readers, “minor recurrence” for 6/15 readers, and “major recurrence” for 7/15 readers. Inter- and intrarater agreement regarding the presence of a recurrence in the subgroup of 32 cases that were studied twice with MRA was very similar to the overall results (Table 2). Power was insufficient to study whether agreement differed with MRAs of different field strengths. There was wide variability in the adjudication of outcomes of endovascular coiling on selected images from catheter angiographic or TOF MRA studies. Agreement was moderate at best and did not improve with rater experience. Disagreement among observers is not explained by divergences in the interpretations of the meaning of the various categories of the scale because agreement between 2 observations from the same raters was also fair to moderate in most cases. Reassuringly, agreement nearly reached a “substantial” level (κ ≥ 0.600) when the final verdict regarding the presence of a major recurrence was dichotomized (present-absent). Agreement when comparing the last angiographic result with the first MRA follow-up study (DSA-MRA), as commonly performed in clinical practice, was similar to MRA-MRA agreement. Agreement was not improved when raters had full access to all images. By contrast, our primary aim was to test the reproducibility of angiographic outcomes as they are assessed in clinical practice with a variety of modalities (DSA, 1.5T and 3T TOF MRA) that are actually used in realistic cases selected to mimic a clinical series. Although Pierot et al6 have proposed that contrast-enhanced MRA performed better than TOF-MRA, most studies did not find a significant difference in accuracy between modalities or field strengths (3T or 1.5T), and for pragmatic reasons, patients cannot always be followed on the same equipment. The strengths of the present study also include a large number of observers with various experience and from various institutions and the inclusion of DSA-MRA comparisons that are often used in clinical practice. At least 21 different grading scales have been reported,4 but most can be translated into the 3-value scale we have previously proposed.11,34 It has been observed that agreement increases as the number of categories is decreased.35 Other ways to improve the reliability of angiographic judgments have been proposed, by using volumetric measurements of residual lesions,4 or by increasing the precision of nominal definitions,24 but the success of such strategies remains to be demonstrated. The present work supports the idea that agreement among observers can reach an acceptable level when the scale is translated into a simple dichotomous verdict (presence or absence of a major recurrence). Our study has several limitations. First, we were careful to include a wide variety of cases that would test agreement in circumstances that were close to clinical conditions with multimodality imaging, but the selection of cases, images, and image parameters was artificial; a different set of cases could have led to different results. Second, we did not include patients treated with stents or stent-assisted coiling; this choice may affect MRA interpretations. Third, aneurysms were, on average, larger; and posterior circulation aneurysms were more frequent than those in typical endovascular series, perhaps because we included a sufficient number of major recurrences to minimize the paradoxes of κ statistics.10,11 The variability we observed in judging the extent of angiographic occlusion of treated aneurysms and the presence of a recurrence at follow-up was probably underestimated by the portfolio method we used to multiply the number of raters. Many potential sources of discrepancies (selection of images, series, or sequences; diverse techniques; and equipment from various centers) were absent. Nevertheless, the substudy on a smaller number of readers having access to all images from the PACS yielded similar results. Finally, how seriously observers worked to come to verdicts can always be questioned, and the context of assessment certainly differed from the normal clinical context. There is an important variability in the assessment of angiographic outcomes of endovascular treatments. Agreement on the presence of a major recurrence when comparing 2 MRA studies or the MRA with the last catheter angiographic study can be substantial. Disclosures: Robert Fahed—RELATED: Grant: Fondation pour la Recherche Médicale, grant number DEA20140630151, Comments: The research grant was accorded to me (Dr. Robert Fahed) from November 2014 to October 2015 as a full-time research year. Laurent Letourneau-Guillon—UNRELATED: Payment for Lectures (including service on Speakers Bureaus): Societe Canadienne Francaise de Radiologie, Comments: honorarium for 1 educational lecture at a radiology meeting. Allan J. Fox—UNRELATED: Expert Testimony: occasional medicolegal case (not relevant to the topic in question); Stock/Stock Options: none related to companies on this topic. David F. Kallmes—UNRELATED: Board Membership: GE Healthcare (Cost-Effectiveness Board membership),* Consultancy: Medtronic (planning and implementing clinical trials)*; Grants/Grants Pending: MicroVention,* Medtronic,* Codman,* Sequent Medical,* NeuroSigma,* Surmodics*; Royalties: University of Virginia Patent Foundation. Jean Raymond—UNRELATED: Grants/Grants Pending: Canadian Institutes of Health research (Canadian UnRuptured Endovascular Versus Surgery Trial),* Codman (Does Embolization With Larger Coils Lead to Better Treatment of Aneurysms Trial). * *Money paid to the institution. Robert Fahed is the recipient of a research scholarship delivered by the Fondation pour la Recherche Médicale, Paris, France (grant number DEA20140630151). ClinicalTrials.gov. Hydrogel Endovascular Aneurysm Treatment Trial (HEAT). https://clinicaltrials.gov/ct2/show/NCT01407952. Accessed July 23, 2015. Accepted after revision September 14, 2015.